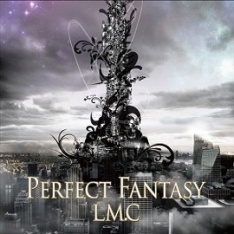 Right after their release in last December, the duo LM.C has released their new mini album named « Perfect Fantasy » in February. Coming in a regular and a limited edition, the eight tracks album includes the last single title “My Favorite Monster”, and was fervently awaited by fans after a wait of eight months since their last full album. The album starts with the mysterious introduction music “Neo Fantasia”, filled with a double bass line and light sounds of violin, giving already the title “Perfect Fantasy” a real meaning. “DOUBLE DRAGON” was already known by the fans as it was a song released in November 2012. The song is entertaining and will give you the need to get up and jump around. You will recognize the bands signature with Aiji’s catchy guitar line and maya’s lyrics full of hope and energy. The song is followed by “Chameleon Dance”, a very energetic track with electro sounds. You can feel influence from their past songs that used also electro, but with LM.C’s ability to add modernity through their years of activity. The English line “it’s time to dance, it’s time to jump, it’s time to rock, it’s time to go!” will definitely stay in your mind. This is personally my favorite song from the album. “禁じられた宇宙” (Kinjirareta Uchuu) is slower, with dynamic and jazzy sounds that mixes well with maya’s fresh voice, while the ballad “mono-logue” will slow down the atmosphere with soft and poetic lyrics. “My Favorite Monster” was also a single track that the fans could have listened to in last December. The song is catchy and dynamic, giving the need to dance around while singing with maya. Again the lyrics of this song are deep and meaningful, prompting you to be yourself and not hiding your true self behind your mask. You will be able to see the fans monsters in the promotional video, as the band asked to them to submit their drawings to use them in the video! An original concept, giving the opportunity even to oversea fans to participate, and have some gratefulness from the duet. “DREAMSCAPE” made me think a little about their past song “SORA” with cute and relaxing sounds. It was without counting on the chorus that suddenly gives an impulse to the track. Maya’s melancholic voice here will give you some chills as well as the beautiful guitar solo by Aiji for this love song. “DIVE TO FANTASY” does not bring more originality to the album, but definitely still has the same LM.C signature with catchy and soft guitar sounds. The song invites you a last time in LM.C’s fantasy before waiting for their next production. The mini album “Perfect Fantasy” may not bring more originality to what the band already offered to their fans, but is definitely a good one to have in your collection. Despite some changing in the band’s management, they still have kept their musical identity and deliver an album with various type of songs, for every tastes.